I finally remembered to photograph my latest project before mailing it this week. It seems like I'm going through a baby knitting spurt recently. If people I know would stop having babies, I could get back to a few other projects (just kidding). One of the reasons I love baby projects is that they're so fast. I'm impatient, so I love the instant gratification of knitting baby items. I love this sweater...in fact, I wish I had an adult size to wear myself. The purple/grey yarn is Skinny Cotton yarn from Blue Sky Alpacas. Some of you may remember a cowl I made with this yarn two years ago. Yes, sometimes extra yarn sits in my stash for over two years. Which brings me to another reason I love baby projects -- they help me use up the small quantities of lovely yarn in my stash. The sweater is knit from the collar down in stockinette stitch (alternating knit and purl rows). The border on the sleeves and sweater is garter stitch (knit all rows). You slip stitches as you make the body of the sweater and then pick up stitches around the body to create the collar and border where the buttons and button holes are. While I was knitting this, I wasn't sure it was going to turn out to be the right size. It felt like I was making doll clothes instead of a sweater to fit a real baby. I hate checking gauge, so I skipped that step. It turns out that it just felt small without the collar and button hole border. Once I added that on, it looked perfect. I finished this up while watching a movie this weekend...and it was just in time! Baby L was born this weekend and the cardigan is in the mail and on its way. Check out the details for the project on my Ravelry page or download the free pattern from Stockinette. PS. Did you know October 12th is "I Love Yarn Day"? I'm putting together a post with my favorite yarns to celebrate, so check back here in a few days! My camera is sitting on a shelf in my living room. It isn't small. It's there staring me in the face every day. Yet I somehow managed to forget to take pictures of my last two knitting projects. It's a shame since they were both so cute. Maybe I was too excited to give them to an expectant mother and a mother of a newborn. The first project I forgot to photograph is the Sunnyside Baby Sweater. I knitted it with grey wool and found the cutest little aqua buttons for it. This project knits up quickly since you make it all in one piece and attach the arms afterwards. Maybe I'll take a picture of the little guy wearing it when he's born in November. So enough about the things I didn't take pictures of...let me share something that I did manage to photograph! I can't believe I've waited this long to share one of my favorite recipes. This has been a staple dessert for me since college. It's so easy, incredibly delicious and only uses a few ingredients (most of which you probably have in your pantry). Best of all, you can make this in about 30 minutes. My favorite part about this dessert is that it looks and tastes like it took hours to make. No one will believe you when you tell them you made it saltines, butter, sugar and chocolate. It's addictive. Just try to only have one piece. About 40 saltine crackers (or enough to cover your baking sheet) *Note* I've also used matzo crackers. They produce a slightly different consistency, but are just as delicious. Preheat the oven to 375 degrees. Line a baking sheet first with foil and then with parchment paper, making sure to cover the entire baking sheet. In a medium saucepan, heat up the butter and brown sugar. Stir the mixture until it starts to boil over medium heat. The mixture will thicken as it heats, so make sure to stir it continuously. Once it starts to boil, continue to let it bubble for about 3 minutes. Remove from heat and add vanilla and salt. Quickly pour the mixture over the saltines. Spread it out so that the mixture covers the saltines evenly. It will begin to set pretty quickly, so work fast. Bake the covered saltines for 15 minutes. Watch it closely so it doesn't burn. If the edges start getting dark, you can reduce the heat. Remove from the oven and sprinkle on the chocolate chips. Let the chips sit for about 5 minutes or until they start to melt. Then use a rubber spatula to spread the chocolate out evenly over the crackers. Sprinkle on nuts. Allow the chocolate to set. I typically put the entire sheet in the freezer. Once the toffee is set, break it apart and serve! Take a second and think back to when you first started knitting. Were you intimidated by difficult techniques? Was it hard to find patterns at your skill level? Did you want a list of beginner knitting patterns? Preferably free beginner knitting patterns? I remember being frustrated by all the terms and techniques. I wanted to knit items I would actually use or give away, but I didn't think I could create those unless I knew all the stitches and advanced knitting techniques. If you're a beginner knitter and need some easy patterns to start out with, this list is for you. You also might be an experienced knitter that just wants an easier pattern for some mindless knitting. For each pattern, I included some of the skills you'll need and where to find the pattern. If you like this list and find it helpful, I'd love to create more. What patterns would you like to see? Top cable knitting patterns? Knitting patterns for the adventurous knitter? Beginner crochet patterns? Leave a comment and let me know! By: Editors of Publications International, Ltd.
How to get it: Visit Ravelry and click on the link to Lion's website. Free registration required to access pattern. I'm sure I missed quite a few...great patterns, so share a link to your favorite pattern for beginners in the comments. I have a little baby sweater on my needles right now. I need to knit the sleeves and find some cute buttons. Once I do, I'll share all about the pattern here. *Update* The winner of the pattern is Sarah Boyce! Congrats! If you'd like to purchase the pattern, you can do so here. As a kid, I used to love owls. I had a book that had an owl in it and couldn't get enough of owls. Ironically, I've also been afraid of birds since I was a kid. I guess they were ok in books, but not in person. Now I have a new type of owl that I love. 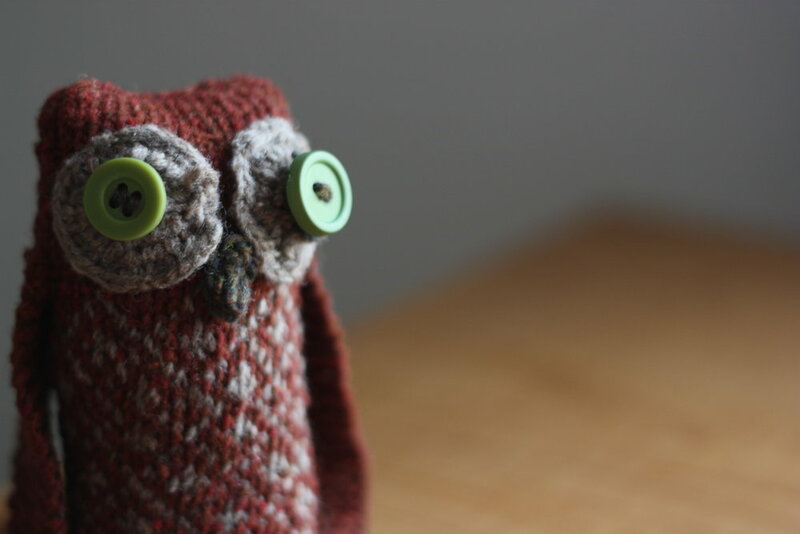 Knitted owls. This little guy was made with some leftover yarn from the Seasons Hat I made earlier this summer. I didn't have much yarn left so my options for using it were limited. In the past, I never liked making stuffed animals. They never quite turned out right and looked lumpy or had holes. But when I found the pattern for the Tawny Owl, I couldn't resist. 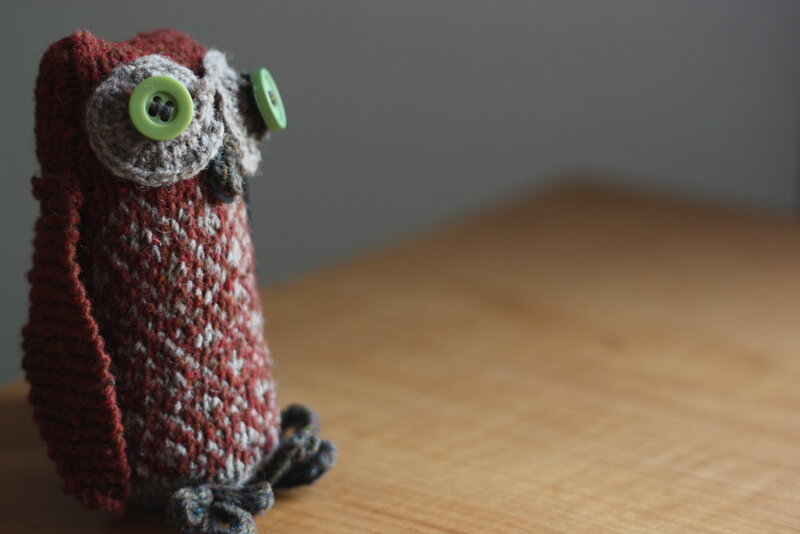 Ella Austin is the designer of the Tawny Owl pattern and she is generously giving away 1 free pattern to one of you! Enter to win by either commenting on this post or sharing it on Facebook (make sure to tag Painting Lilies in your post so I see the notification). 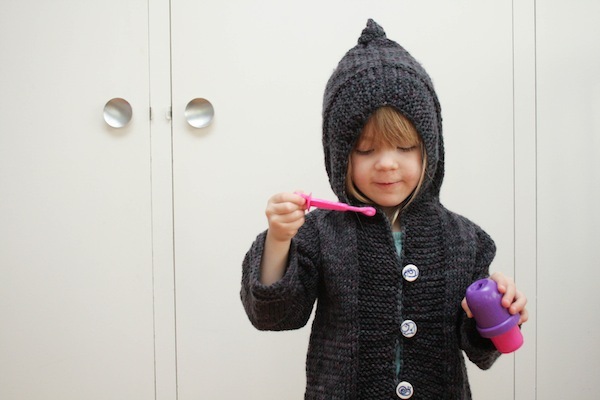 Ella has some great knitting patterns in herRavelry storeand sells knitting kits on Etsy (pattern + yarn). You can follow her on her blog, too. You have until Tuesday, August 28th at 12PM Mountain to enter the contest. I'll announce the winner of the pattern here on the blog! I haven't challenged myself by learning a new knitting technique in quite a while. The Tunisian Crochet Stitch was new, but not too much of a challenge. Last summer I designed my first pattern. My first crochet project remains one of my favorites, mainly because I love the colors. I've always wanted to learn how to knit with multiple colors using color charts and stranding. Even though I've mastered lace knitting and cables and other advanced techniques, this one seemed too difficult. How do you hold multiple strands? What if they get tangled? How do I correct errors? I'm happy to announce that I finally conquered my fear of color knitting with the Seasons Hat from Brooklyn Tweed. After the Tunisian Tweed Baby Blanket, I needed a quick project that would be easy to make in the summer. I wanted to learn something new and I had my eye on this pattern for several months. When I received the 5 page pattern (for a hat! ), it looked intimidating, but I took it one step at a time and created a hat that I can't wait to wear this fall when the weather cools down. Are you a new knitter looking to move beyond knit and purl stitches? Or are you a seasoned knitter like me that wants to master a new technique? 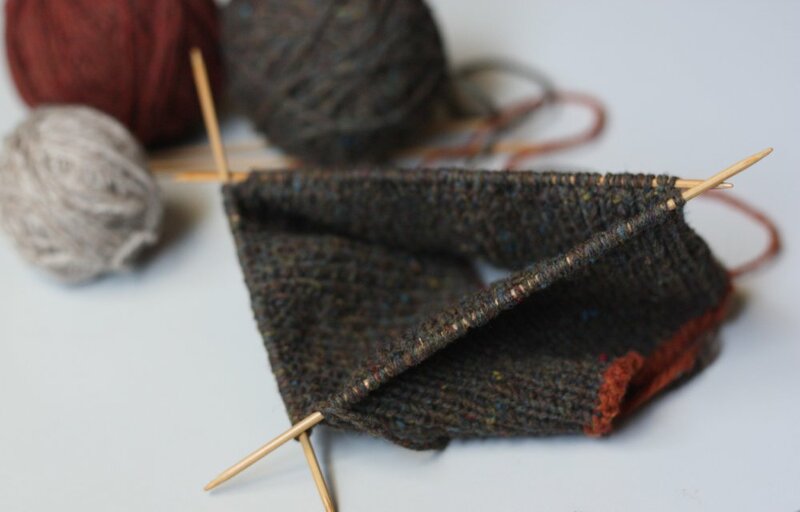 Whether you're a newbie or a pro, here are a few tips for expanding your knitting skills. You find a design you love, but when you look at the pattern it has charts and looks like it's written in another language. What in the world is a SK2po? How do I interpret all those signs in the chart? Knitting patterns often look scarier than they are. They have all sorts of unfamiliar terms and abbreviations, but once you decode it, you find that there is a pattern and it may even be an easy to understand pattern. The first step when looking at a new pattern is not to let the pattern intimidate you. Just because you don't understand everything at first glance, doesn't mean you can't make it. Don't get caught in the first paragraph, instead read through the entire pattern and try to get an idea of how the whole pattern progresses. After you read through it once or twice, go back and circle or underline the steps you don't understand. I have a tendency to skip this step and just start knitting. This inevitably causes me problems later on as I have to go back, rip out sections and review the pattern. If you have an understanding for the entire pattern, it's easier to notice mistakes along the way. I'm not sure how people learned to knit before the internet. How did you find amazing patterns without Ravelry? How did you learn new techniques without Google searches? There isn't much of an excuse to not learn new knitting techniques with all the free information available with a simple Google search. You won't just find descriptions and pictures, but you can often find a YouTube video that walks you through the technique step by step. This can be especially helpful when you have no idea where to start with a new stitch or cast on method. I often look up videos as a refresher for techniques I haven't used in a while. YouTube is your best friend when you're trying to learn a new knitting skill. Once you've read through the pattern and looked up unfamiliar terms, take the pattern step by step. Don't get ahead of yourself and start progressing through the pattern. When you get to the parts of the pattern with new techniques, refresh your memory by reviewing videos and instructions. If you take it one step at a time, you'll find that the intimidating, scary project isn't so hard after all. Sometimes you get stuck with a pattern. You've looked it over a million times and the instructions just don't make sense. When you get stuck, don't give up. Instead, ask a more experienced knitter to help you interpret the instructions. I used to get stuck all the time on patterns when I didn't understand what they were asking me to do. When I got confused, I always called my Mom for help. She was always able to help me figure out what I needed to do, even when she couldn't see the knitting project. If you don't know other knitters, head to your nearest knitting store and ask the experts there for help. Join a knitting club and meet other knitters. Or email the pattern designer to ask for help. Don't give up just because you can't figure it out on your own. Once you finish your project, hopefully you'll be excited about all the new possibilities you have now that you've mastered a new technique. Don't stop there and challenge yourself to learn something new again. I really enjoyed making this hat. Shelter yarn is a joy to work with, especially since the last project I made used acrylic yarn. Wool is ten million times better to work with than acrylics. 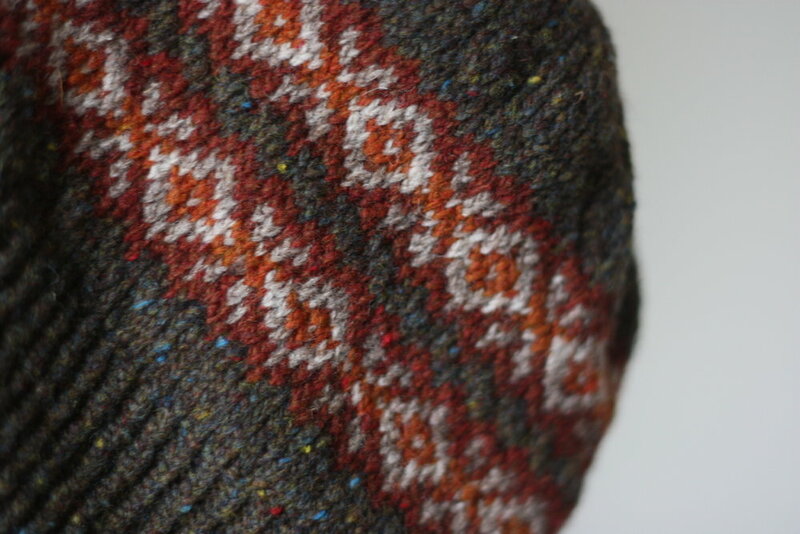 There are a few Fair Isle projects I'd like to try next to continue to perfect my stranded knitting. And perhaps the next step will be to design my own pattern using a color chart! What was the last technique you learned? Or which technique are you afraid to try? Share below! Is it too early to be thinking about Fall? Here we are on the second official day of Summer and I'm longing for cool, fall days with sweatshirts and pumpkin and football. There are things I like about Summer, but I'm not a hot weather girl. And it has been VERY hot in Denver so far this summer. We're setting record highs each week with temperatures in the upper 90s. So what have I been doing to cool off? On Sunday, I biked 100 miles in 100 degree weather. That wasn't much fun. The wind and forest fires didn't help the biking conditions much, either. I've also been knitting a wool hat, which isn't much of a summer activity. A couple of weeks ago, I treated myself to some fancy yarn from Brooklyn Tweed and am currently knitting the Seasons Hat. Which colorway? Naturally, I'm knitting with browns and oranges and fall colors. This is my first project with stranded color knitting. I haven't reached that part of the pattern yet, but am excited to learn a new knitting skill that I haven't mastered yet. So far, I LOVE the yarn. It's beautiful, the colors are lovely and it's so easy to work with. But maybe I'm just biased since my last project was made with synthetic yarn. Wool always trumps synthetic yarn for me. Maybe I should stop thinking about Fall and embrace Summer? I have plans to make popsicles this weekend...perhaps the next step is to dig out the bathing suit and go for a swim after my hot bike rides! After finishing the never-ending project (aka the Tunisian Tweed Blanket), I'm trying to figure out what to tackle next. It's summer, which means I'm way less excited about knitting. It's hard to get motivated to make warm garments when you're sweating and winter seems a million miles away. Also, knitting large garments and blankets doesn't exactly help you cool down. But the problem is that I don't start knitting again until it's already cold. At that point I want to be wearing cool, handmade items, not knitting them. Plus, there's the goal I set this year to knit a sweater. A sweater that I can wear. And I'm pretty sure that I should start that soon so that I'm not scrambling to do it in December. Why are all the cute sweater patterns for kids? I can't seem to find an adult sized sweater that doesn't look...well, super homemade. Maybe I'll start by knitting a kid-sized sweater and then move onto one that works for me? Does anyone have any summer knitting suggestions? How about any good patterns for adult sweaters? Saturday was my birthday! If you've been reading for a while, you might know that last year was my Golden Birthday. I turned 28 on the 28th. I celebrated by doing 28 things. Compared to last year, this year wasn't quite as exciting. My main plans were to go for a bike ride, but after a big bike wipeout on Friday, I had to take it easy and nurse my cuts and bruises on Saturday. I did receive a few new "toys". Making pasta seems complicated, but it's quite easy. I'm not sure why it took me so long to try it. You simply mix flour and eggs together (2 eggs for every cup of flour) and then knead it. The great think about the pasta maker is that you just have to mix the dough and then flatten it enough to send it through the machine a few times until it comes elastic and easy to work with. Once you get it to the desired thickness, you put it through the side that cuts the pasta. And just like that, homemade pasta. I let mine dry for about an hour before cooking it, but you can make it and store it to use later. I want to experiment with different thicknesses. The pasta I made this week was a little too thick. But practices makes perfect and I intend to use this for all my pasta dishes going forward. I'm a little obsessed with popsicles in the summer. I eat them everyday. I'm really excited that I can make them on my own now. My biggest frustration with homemade popsicles in the past was that you had to wait hours for them to freeze before you could enjoy them. When I crave a popsicle, I want it now...not in 24 hours. You keep your Zoku in the freezer and the liquid core stays cold and frozen. So when you want a popsicle, all you have to do is take it out, pour in some juice and in only 7 minutes, you have a delicious frozen popsicle...or two or three. You can make up to 6 at once with my little Zoku. I'm really excited to try some of the recipes on the Zoku blog like Cucumber Mint Margarita, Apple Pear & Orange and Berry Mojito. Adult, happy hour popsicles? Sounds like an excellent summer time treat. My last birthday treat was an electric kitska for making Ukrainian Eggs. I can't wait to try this out next Easter and see if the electric kitska helps make smoother lines! Those of you who are on my email list might have received an email from me on Saturday. I had great intentions of holding a birthday sale on my knitting patterns. But then I made a mistake and forgot to change the subject line of my email. So it probably looked like I was sending a duplicate email inviting you to join me on Pinterest, when really I was trying to offer you a special discount on my patterns. Originally, I had the sale ending on Sunday, April 29th at midnight, but I'm extending it until Sunday, May 6th. During the sale, you can have all three for only $5! As an added bonus, if you purchase this special birthday bundle, you'll get my next pattern for free. It's a crochet blanket made using the Afghan/Tunisian stitch and should be ready in a week or two. All four patterns would typically cost $16, but you can have them at 70% off! You have until Midnight (Mountain Standard Time) on Sunday, May 6th to order. I will email you the patterns within 2 days after your purchase (to the email you use on PayPal). If you prefer to receive the patterns at a different email address, please email me with your PayPal purchase ID and the email address you used to purchase the patterns. Instead of sharing my own projects with you this week, I'm going to showcase some awesome projects from other creative bloggers out there. This project from A Creative Cookie will show you how to create a yarn pot with only yarn, elmer's glue and a piece of cardboard. I think this would be a great little project to use up scrap yarn. I could use a few of these to hold odds and ends on my desk and maybe in the bathroom, too. Wouldn't one of these look cute piled up with cotton balls? Or Q-tips? Or paper clips? 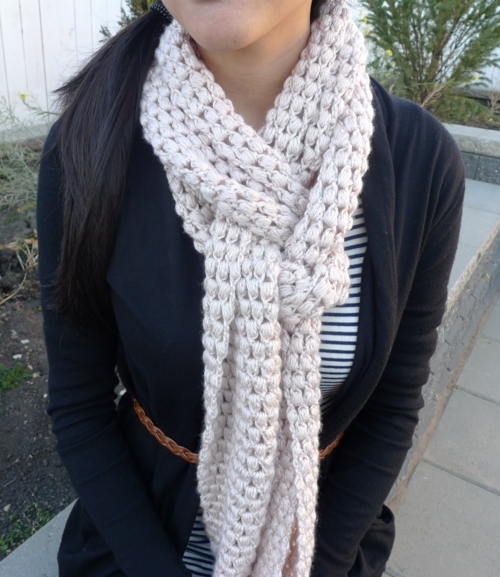 I rarely crochet items to wear, but really like this pattern for a crocheted scarf from All About Ami. The pattern is simple and easy for beginners and it only uses 3 skeins of yarn! This looks like a fun and quick project. And as I sit here typing this on a cold February afternoon, I think I would like to be wearing this scarf right now. Here's another great scrap yarn project. 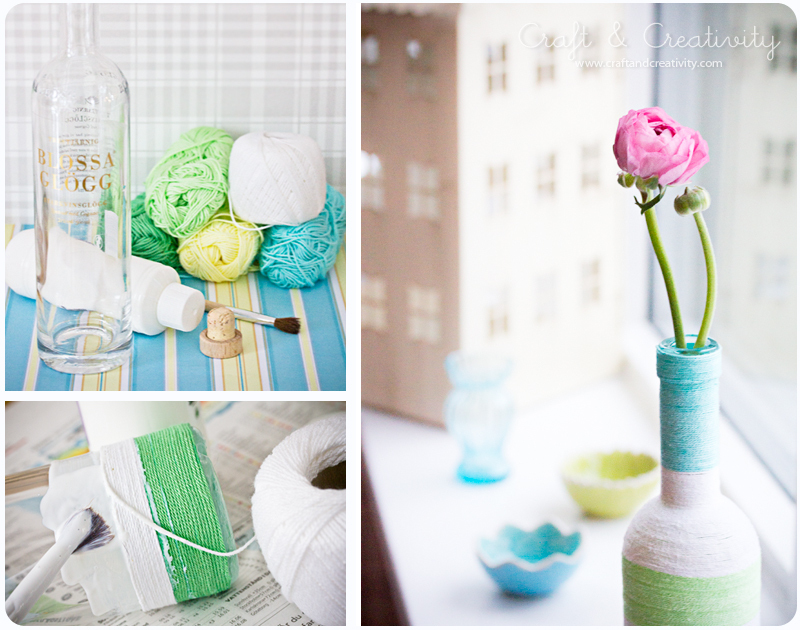 Craft and Creativity shows us how to add color to old bottles with some yarn and modge podge / glue. I love the bright colors! Kitty from A Law Student's Journey shows us how to create a camera lens cover without any knitting involved. This will take you 2 minutes with some leftover thrift store sweaters. Great idea for protecting those extra lenses. What crafty creations are you working on? Want to have one featured here? Email me your blog link or photos!